Stars: Ansel Elgort, Kevin Spacey, Jamie Foxx, Jon Hamm, Lily James, Eiza Gonzalez, Jon Bernthal, Flea, Lanny Joon, C J Jones. British director Edgar Wright (Shaun Of The Dead, etc) was raised on a diet of Hollywood genre films, but his quirky sensibility and sense of humour subverts the usual tropes of the genre. His Hot Fuzz was a loving homage to those American crime films he loved watching. A decade on he returns to the crime genre with Baby Driver, an immensely entertaining and fast paced heist film/car chase thriller set in Atlanta. He has left behind Britain and his Cornetto trilogy for his first film shot in the US. 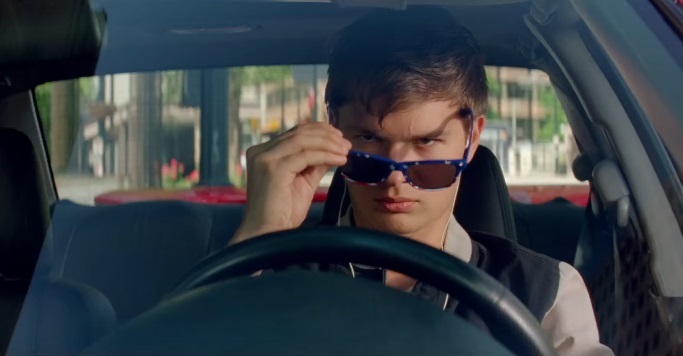 Baby Driver centres around Baby (played by Ansel Elgort), a young getaway driver who, despite his age, is one of the best in the business. He is “Mozart in a go-kart,” according to one character. He has been stealing cars since he was 12. Due to a childhood accident in which his parents were killed, Baby suffers from tinnitus. To block out the persistent buzzing in his ears he wears earbuds and listens to music. He has an extensive collection of songs and lives to the beat of his own permanent playlist. Baby lives with his foster father Joseph (C J Jones), an elderly deaf man who is also wheelchair bound. He hides his loot under the floorboards of their dilapidated apartment in a seedy area of the city. He works for the manipulative and malevolent Doc (Kevin Spacey), a criminal mastermind who meticulously plans daring bank robberies. Baby owes a debt to Doc and is being blackmailed into repaying it through his work as a getaway driver. But when he falls for pretty young waitress Debora (Lily James, from Pride And Prejudice And Zombies, etc) Baby plans to leave this world behind and go straight. Unfortunately, Doc has other ideas, and Baby is forced to do one more job, which sets in motion a chain of violent events. Doc never uses the same gang twice in a row, so we get a colourful collection of disparate, seedy gangster types, including Oscar winner Jamie Foxx as the violent and unpredictable psychopath Bats. Jon Hamm (Mad Men, etc) is largely cast against type as Buddy, a former nice guy fallen on hard times due his drug addiction, while Mexican actress Eiza Gonzalez (from From Dusk To Dawn: The Series, etc) plays Darling, his gun toting and tough talking girlfriend. Jon Bernthal is the enigmatic Griff; Flea, from the rock band Red Hot Chilli Peppers is the wonderfully named Eddie No-nose and Lanny Joon plays JD. Wright wastes little time in getting straight into the action. Baby Driver features some great, carefully choreographed hyperpaced car chases, which Wright handles with plenty of frenetic energy and imaginative stunt work. Because Baby wears earbuds all the time, music plays an important role in the film. The action is accompanied by a killer soundtrack that features a great selection of music, ranging from one hit wonders Golden Earring through to Queen. The action has been beautifully edited by Jonathan Amos and Paul Machliss (who worked on Wright’s Scott Pilgrim vs The World, etc), who cut the car chases to the rhythm of the music, and each song perfectly suits the mood of a particular scene. And Bill Pope’s crisp widescreen cinematography is also excellent as he captures the vehicular mayhem from a variety of angles. Wright apparently first conceived of the idea for the film while he was directing the music video for Blue Song for British electronic group Mint Royale. The film actually takes its name from a Simon and Garfunkel song that appeared on their classic 1970 Grammy winning album Bridge Over Troubled Water. Baby Driver is a stylish film, albeit a little derivative at times, and is a bit of a throwback to the hardboiled American crime films of the 70s. It will remind audiences of some of those great car chase films of the era, most notably Walter Hill’s The Driver, which starred Ryan O’Neal and Bruce Dern, The Blues Brothers, and John Frankenheimer’s superb Ronin from 1998. It’s certainly much more grounded than the increasingly over the top Fast And The Furious franchise, which has increasingly relied on CGI for its car stunt work. There is a great shootout sequence during one robbery that mimics a classic scene from Michael Mann’s Heat. This is a breakout role for the fresh-faced Elgort, who has appeared in the Divergent trilogy, where he was largely wasted, and the teen weepie The Fault In Our Stars, etc. He brings plenty of charm to his performance here as the damaged Baby, and he is endearing and likeable. Foxx brings a dangerous edge to his portrayal of the unhinged and volatile Bats. Spacey is terrific as usual; he is slick and suave as Doc, but he also brings a hint of menace to his performance. James brings a nice mix of vulnerability and intelligence to her performance as Debora, a waitress with a heart of gold and a nice smile, and her presence tempers the testosterone fuelled action. There is also a palpable chemistry between Elgort and James that adds to the romantic subplot. Baby Driver is one cool action movie and demonstrates Wright’s deft command of the language of cinema and his understanding of the genre conventions. This is, arguably, his best film since Shaun Of The Dead.